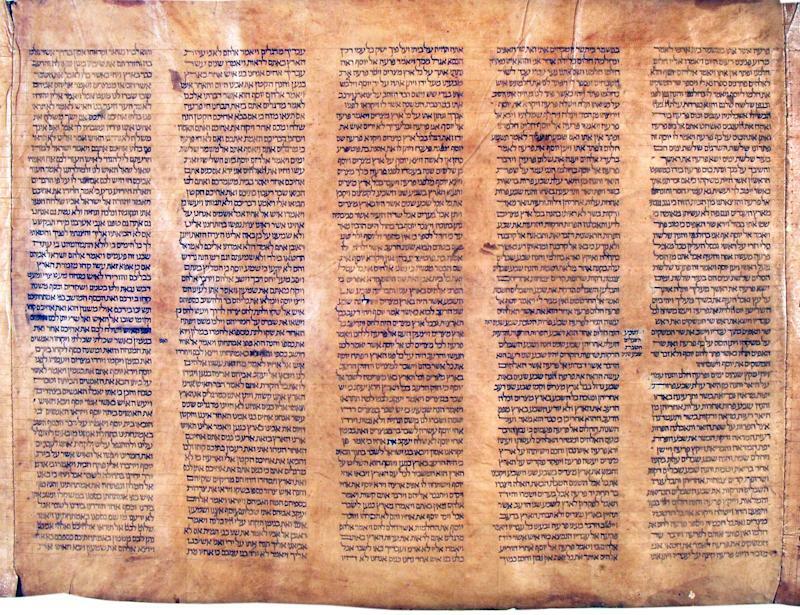 ROME (AP) — An Italian expert in Hebrew manuscripts said Wednesday he has discovered the oldest known complete Torah scroll, a sheepskin document dating from 1155-1225. It was right under his nose, in the University of Bologna library, where it had been mistakenly catalogued a century ago as dating from the 17th century. The find isn't the oldest Torah text in the world: the Leningrad and the Aleppo bibles — both of them Hebrew codexes, or books — pre-date the Bologna scroll by more than 200 years. But this is the oldest Torah scroll of the Pentateuch, the five books of Moses, according to Mauro Perani, a professor of Hebrew in the University of Bologna's cultural heritage department. Two separate carbon-dating tests — performed by the University of Salento in Italy and the Radiocarbon Dating Laboratory at the University of Illinois, Urbana-Champaign — confirmed the revised dating, according to a statement from the University of Bologna. Such scrolls — this one is 36 meters (40 yards) long and 64 centimeters (25 inches) high — are brought out in synagogues on the Sabbath and holidays, and portions are read aloud in public. Few such scrolls have survived since old or damaged Torahs have to be buried or stored in a closed room in a synagogue. In a telephone interview Wednesday, Perani said he was updating the library's Hebrew manuscript catalogue when he stumbled upon the scroll in February. He said he immediately recognized the scroll had been wrongly dated by the last cataloguer in 1889, because he recognized that its script and other graphic notations were far older. Specifically, he said the scroll doesn't take into account the rabbinical rules that standardized how the Pentateuch should be copied that were established by Maimonides in the late 12th century. The scroll contains many features and markings that would be forbidden under those rules, he said. The 1889 cataloguer, a Jew named Leonello Modona, had described the letters in the scroll as "an Italian script, rather clumsy-looking, in which certain letters, as well as the usual crowns and strokes show uncommon and strange appendices," according to the University of Bologna release. Perani, however, saw in the document an elegant script whose square letters were of Babylonian tradition, the statement said. Perani told The Associated Press it was "completely normal" for a cataloguer to make such a mistake in the late 1800s, given the "science of manuscripts was not yet born." Outside experts said the finding was important, even though older Hebrew bibles do exist. "It is fairly big news," said James Aiken, a lecturer in Hebrew and Old Testament studies at Cambridge University. "Hebrew scholars get excited by very small things, but it certainly is important and clearly looks like a very beautiful scroll." However, Giovanni Garbini, a leading expert on ancient Semitic languages and retired professor at Rome's La Sapienza university, said the discovery doesn't change much about what the world knows about Hebrew manuscripts. "It's an example of an ancient scroll, but from the point of view of knowledge, it doesn't change anything," he said in a telephone interview. But Stephen Phann, acting president of the University of the Holy Land in Jerusalem and an expert in ancient Jewish manuscripts, said if accurately dated, the scroll is a rare and important find. "We don't have anything much from that period," Phann said. There are far older scraps of Torah scrolls that can be dated back to the 8th century, but Phann said it was rare to find a complete manuscript. The find was also emotionally important, he said because the scroll, as opposed to a bound book, is used for reading Torah portions throughout the year in synagogue. "It's almost a friendship — that they have come to know the Torah scroll in their midst, and they draw their knowledge and focus on worship on how they live their daily life," Phann said. Perani said it remains a mystery how the scroll came to be part of the Bologna university library but that he anticipated further study would now begin. The scroll remains in the library and doesn't require any extra conservation precautions beyond what it already has, he said. Diaa Hadid contributed from Jerusalem.